Wine Shades are the PERFECT QUICK gift, especially if you make them out of a fabric that boasts a friend's absolute FAVORITE thing!!! Just cut, stitch, turn, fuse, and finish to make ADORABLE (aka, cute, darling, so sweet! 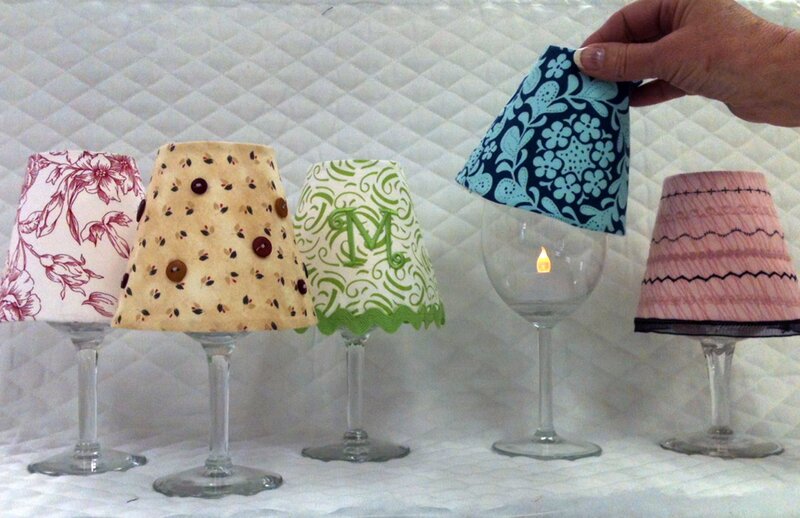 ), 10-minute, lamp shades for wine glasses (or pint jars). Two shades per panel. Instructions and tips printed on the interfacing. Five 12" x 18" fusible interfacing panels per pack (10 shades per pack!). Get those glasses at the Thrift Shop, add an LED tealight, grab a 10" square of fabric, secure 10 minutes, and OH MY - the best little nightlight or table dec ever!